With NASA's big announcement about evidence of water on Mars and this past weekend's Supermoon Eclipse, I just can't stop thinking about space! 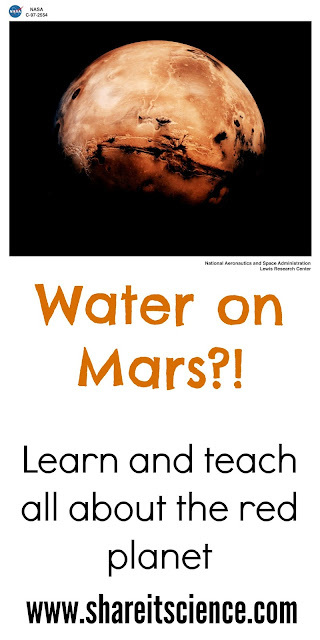 So what is the big deal about water on Mars? Haven't we been talking about evidence of water and ice on the red planet for the past few years? This announcement is slightly different, but immensely more important. Evidence of ice, or water existing on Mars in the past has been common, but this time around the evidence is pointing to water intermittently flowing on the planet in present day. In order to determine if there is life as we know it on other planets NASA scientists have followed evidence of water as their guide. Living things need water, so it stands to reason if you find water, you could also find life. Mariner 9, launched in 1971, was the first to identify evidence of water on Mars when it transmitted images of riverbeds, canyons, erosion and fog back to Earth. Mariner 9 was the first artificial satellite of Mars, and photomapped 100% of the martian surface from 1971-1972. 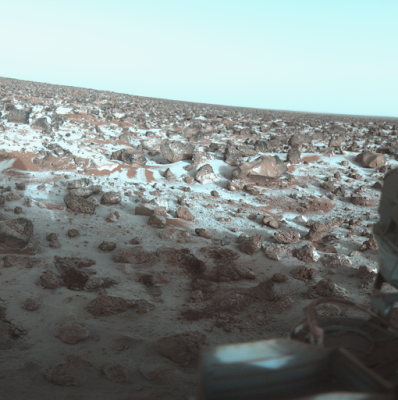 The Viking program further revolutionized our thinking about water on the red planet. 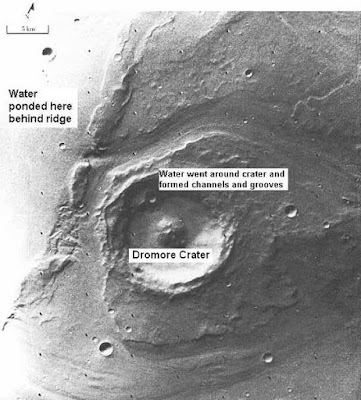 The Viking spacecraft were the first to land safely on the surface of Mars. Both Viking 1 and Viking 2 reached the planet in 1976. The two pairs of lander and orbiter systems collected scientific data and photographed the surface in addition to completing biological experiments aimed to determine whether their was life on Mars. In the process the Viking landers discovered many geological features that further indicated the presence of water historically on the planet, such as deep valleys and valley networks in addition to erosion on the bedrock. Investigation and evidence building toward the discovery of water on Mars continued throughout the next few decades with the Mars Global Surveyor (data on mineral composition), Mars Pathfinder (temperature readings and evidence of clouds and maybe fog), Mars Odyssey (evidence of vast regions of ice under the surface of Mars), Phoenix Mars Lander (confirmed evidence of water ice), Mars Rovers- Spirit and Opportunity, and finally the Mars Reconnaissance Orbiter (evidence of hot springs, heavy precipitation, and hydrated salts causing dark streaking). 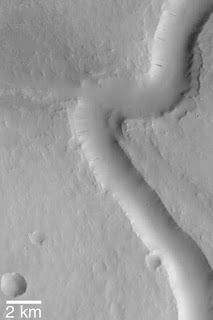 Mars Odyssey Image by Jim Secosky, modified NASA image. The announcement of present day water on Mars comes from data from the Mars Reconnaissance Orbiter. Spectrometer readings showed hydrated salts that coincide with streaking noticed on the surface. The concentration of salts would lower the freezing point of briny water so that it could flow as a liquid. This is the same principle in place on icy roads in the winter, salt lowers the freezing point of the water so that the road is not coated with a layer of ice. The dark streaking on the surface showed how the salty water flowed downhill during warmer temperatures, and the streaks lightened during cooler temperatures indicating that the flow has slowed or stopped. The liquid is most likely just under the surface and wicking to the surface causing the streaking patterns. This evidence led to NASA's big announcement about water on Mars. This announcement is just another step towards NASA's Journey to Mars, a mission to send humans to Mars in the 2030's, a goal outlined in the NASA Authorization Act of 2010 and in the U.S. National Space Policy, also in 2010. There are so many ways to use this historic announcement to raise interest in space education. NASA has a wealth of information and teaching resources that you will in the resources section below. You can also keep up with all things NASA at home or in the classroom with NASA TV, a live stream on YouTube. NASA: "NASA Confirms Evidence that Liquid Water Flows on Today's Mars"
NY Times: "Mars Shows Signs of Having Flowing Water, Possible Niches for Life, NASA Says"
Groovy Lab in a Box Sweepstakes! Calling all STEMists! What is a STEMist? A kid that is wild about Science, Technology, Engineering and Math! If this describes someone you know, you won't want to miss Groovy Lab in a Box's subscription giveaway! From now until October 15th, 2015, you can enter to win a year's subscription to Groovy Lab in a Box (valued over $287). 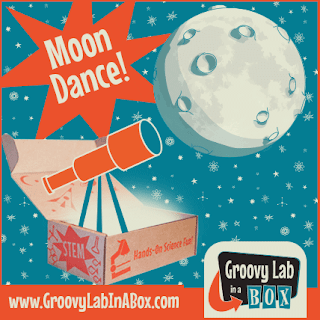 Groovy Lab in a Box sends a box of fun, hands-on, STEM activities to your mailbox each month. Each box includes several investigations that lead to a hands-on engineering design challenge. The engineering challenge requires your STEMist to apply what they have learned from the investigations and their own critical thinking skills to complete. Everything you need for the activities is included in the box, with supplemental material like videos and interactives on their website through the Beyond...in a Box web portal. Visit their website for more details about this awesome subscription service. Did you know that it was National Dog Week? You probably know a lot about your furry pal, like her favorite toys and treats, or his favorite place go for a walk. Although we are pretty familiar with dogs behavior and habits, how much do you actually know about the science of your dog? Did you know, for example, that your dog's nostrils work independently of one another so they can better pinpoint scents? Or that when your dog looks at you, the level of the hormone oxytocin (the "love" hormone) in its body rises? Yes, all true. What else can we learn about the science of dogs? A dog's sense of smell is one of its most amazing senses. For all sorts of fascinating facts and links to lessons about dog science, check out Science Netlinks- Dogs Sense of Smell. If you are into learning about recent scientific research, visit Science Daily's site on dogs. You'll find that recent studies have determined a lot about dog and cat evolution. Very interesting stuff! From genetics and breeding to pet care and the Iditarod sled race, there is a lot to learn about dogs. Check out the following links for all sorts of lesson plans and science activities for school or home about man, woman and children's best friend! 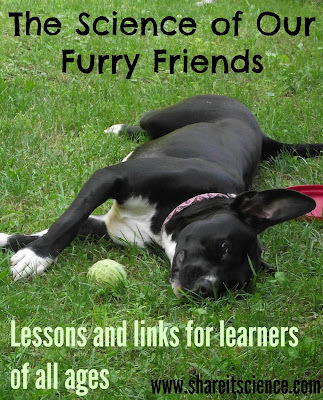 Science Netlinks- Dogs Sense of Smell includes lesson plan links! Changing Seasons: So Much More Than Temperature! Happy Autumnal Equinox! Autumna-wha? More on that later, just know that September 22nd is the official beginning of the fall season! 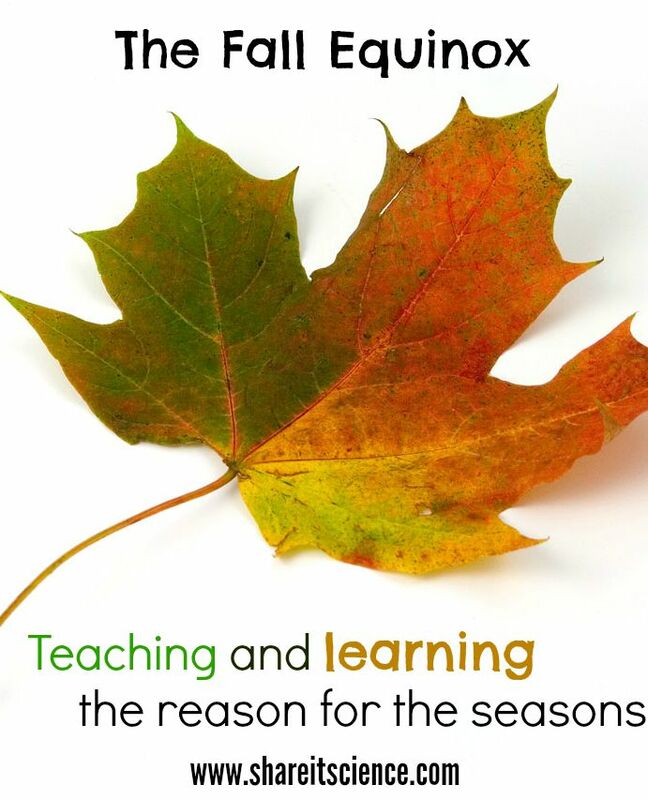 In this post you'll find some great resources for explaining the changing seasons to kids, and some pitfalls to avoid. If you live where the leaves change color you might be seeing some of that happening, and you may be somewhere where the temperature is cooling. What other signs have you experienced as the seasons change? Migrations, plants dying back, fuzzy caterpillars, apples, etc. etc. The days begin to get shorter, with a little less daylight each day...ahhh, now we're getting somewhere. Do you know what causes the changing seasons? I'll give you a second to think about it.... Got it? Did you say the seasons change as Earth moves closer and further from the sun? How good do you feel about that answer? Hate to tell you, but that is incorrect. The good news is- you are not alone. This is probably one of the most pervasive science misconceptions we face. Just remember this- it's all about that tilt. For those of us who have taken a science teaching methods course, this is probably a familiar topic. An interesting video was made a while back called, A Private Universe, explores these misconceptions. In what is now a well-known opening scene, Harvard students on their graduation day are asked what causes the Earth to have seasons. Although you have to purchase this video to see it in its entirety, here is a snippet. You quickly begin to see that regardless of a high quality education, science misconceptions lurk! Harvard students take note: It's all about that tilt. 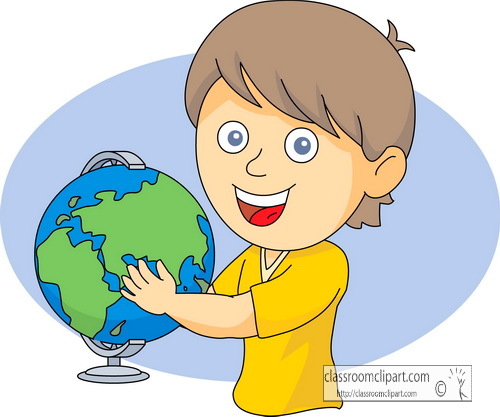 The Earth rotates on its own axis as it revolves around the sun. Imagine the Earth is a cherry tomato and we put a skewer through the center. The skewer is the Earth's axis. This axis does not stand perfectly upright, it leans to one side. (Scientists believe at some point we were hit with something big that knocked us off kilter.) Now, maintaining your angle of axis, revolve your skewered tomato around the "sun"- a basketball perhaps. Is the same part of the tomato leaning towards the sun? As the planet revolves around the sun, in what is almost a perfectly circular orbit, there are points of time when the Northern hemisphere receives more direct sunlight than the Southern hemisphere. At this time of the year, the Northern hemisphere is experiencing summer, the Southern hemisphere is experiencing winter, and vice versa. 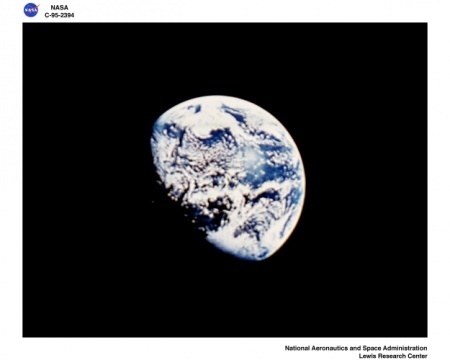 For a great graphic illustrating this concept visit NASA's Space Place page on seasons. Ok, so what about that whole "Autumnal Equinox" thing? There are 2 points in the year when the hemispheres receive equal amounts of sunlight because for just a short period of time the Earth is "upright" rather than tilted, in relation to the sun. Today we will have the equal amounts of daylight and night time- about 12 hours each. You may have noticed equal and equinox share the root- equ meaning similar. The second equinox is in the springtime, or the Vernal Equinox. NASA Space Place: What Causes the Seasons? If you are teaching or studying about changes that happen in the autumn, you'll want to try this science experiment that helps us understand why the leaves change color. You also won't want to miss these 20 must-try science experiments for fall! Supermoon? Blood moon? Eclipse? It's only a few nights away- Sunday, September 27th, 2015. You'll want to try to see it because it won't happen again for another 18 years...but what does it all mean and how can you view it? This video from NASA very succinctly and clearly shows what it means to have a "Supermoon" and a lunar eclipse. 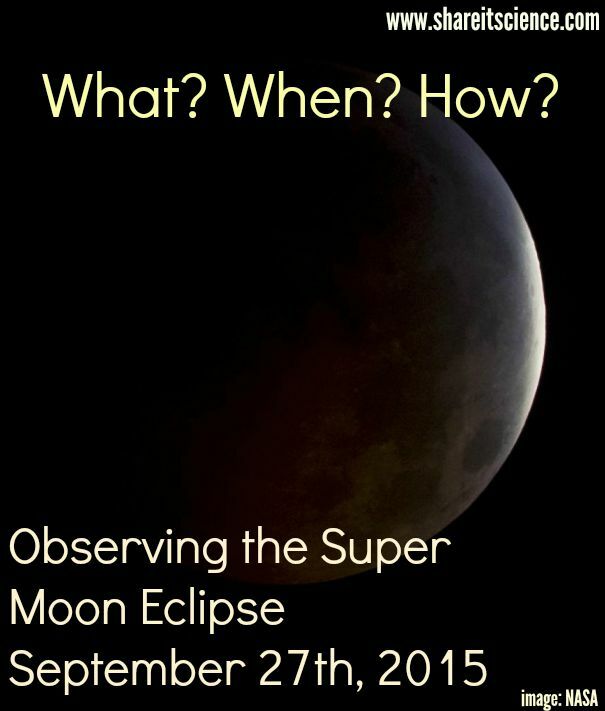 Lunar eclipses are a great opportunity for star gazing. They are more "user friendly" than solar eclipses for several reasons. One is that you don't need protective eye gear to enjoy one! 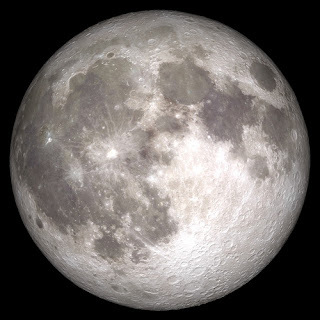 Another is that they are far more common because the shadow the Earth casts on the moon is much larger than the shadow the moon casts on the sun. This will be the fourth lunar eclipse in the past 2 years. Ok, we've got the supermoon and eclipse portion figured out- blood moon? That sounds ominous! 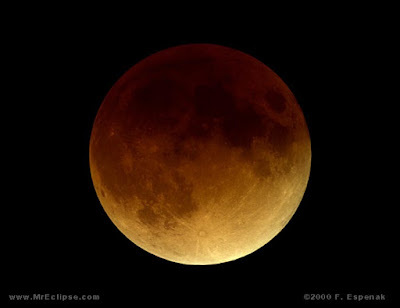 The term, as far as science is concerned, has to do with the orange-red color of the moon during an eclipse. There are religious beliefs about the "blood moon" and its connotations, but we won't touch upon those here. The moon turns this reddish color for the same reason we see these colors in sunsets and sunrises. The Earth's atmosphere works like a lens with a filter on it. It bends the red wavelengths of light and scatters the blue wavelengths. I hope you can get out and view at least part of the eclipse on Sunday, September 27th. 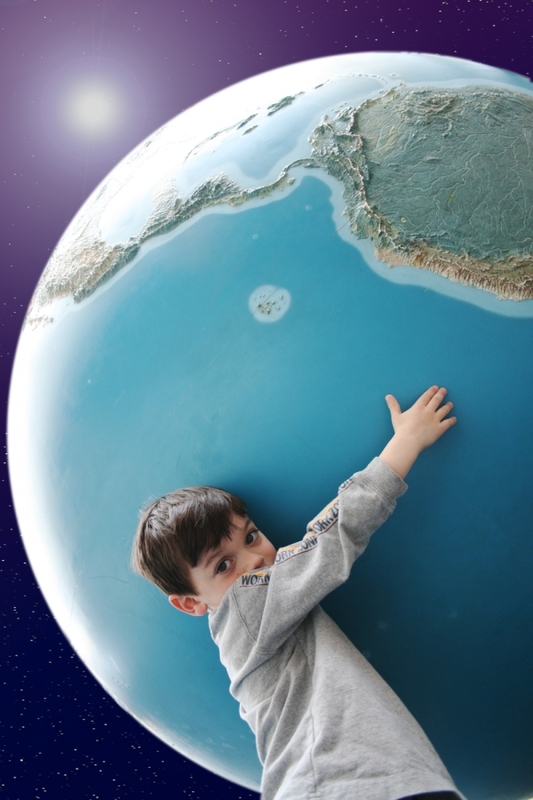 For all sorts of information on when to look, check out this article from Earth Sky. The total eclipse begins at 2:11 Universal Time. You can convert UT to your time zone here. H.A. Rey's Find the Constellations. If you'd like to go high tech another excellent tool for orienting yourself to the night sky is Google's Sky Map app. With the app you simply hold your phone or device up toward the sky and it shows what you should be seeing in that location. However, I'd urge you to turn off your gadgets once you know what you're looking at and just enjoy! If you like astronomy topics you might want to read my other posts that involve the sky and beyond by following this link. 'Tis the season for harvesting fruit and veggies. Maybe you are overrun with tomatoes or squash. What is the best way to preserve your harvest before science takes over and those beautiful veggies start to spoil? Luckily, there are several options depending on the amount of time you have to do it, and your level of expertise. 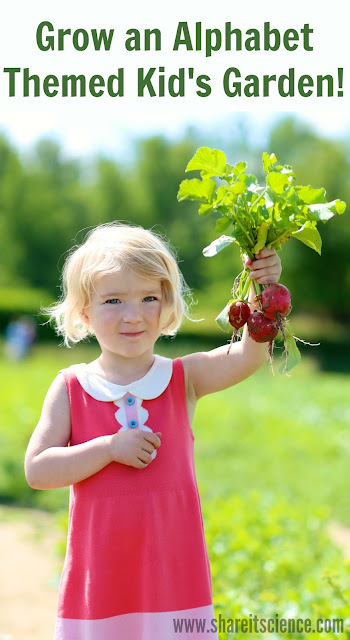 Harvesting your garden is also a great kid's activity. Kids love digging potatoes, harvesting popcorn, and pulling carrots. There is also a ton of science involved in food preservation, including concepts like: pressure, vacuums, bacteria, decomposition, life cycles, etc. 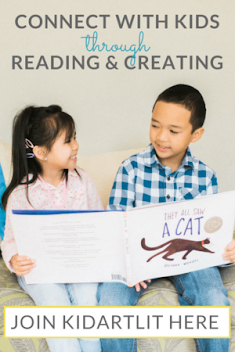 There are so many ways to make this type of work a fun, learning experience for you, your students or children. Tomatoes on the window seat, tomatoes on the counter, tomatoes in the freezer and tomatoes on the vine. I would love to make some pasta sauce with those beautiful Romas and San Marzanos, dice up the Costolutos and put them in jars. I would even like to roast some cherry tomatoes and pop them in the freezer for a mid-winter treat. I know what you are thinking, "Well then, less talk, more action!". Alas, you need a critical amount of tomatoes of each type before you begin to can, blanch, freeze or dry and they don't all ripen at once. Gardening is part patience, part intense action. Here we are at week 25 of my garden adventure for 2015 and I've waited patiently for this moment to come. Once your produce is ready there is only a small window of time before it becomes overripe, or an opportunistic woodchuck, chipmunk or rabbit comes along...instead of "hurry up and wait" we're playing a game of "wait and hurry up". So what is the rush? How can you preserve your beautiful produce to save for later instead of eating salads for the next 3 weeks? Why do you need to process it, heat it to a certain temperature, freeze it solid or dry it out? Microorganisms, such as bacteria, are ready to do their part in the decomposition portion of your plant's life cycle. The plant grew your produce as a way of disseminating its own seeds, not as a kind gesture or repayment for watering it all summer. Once it has grown its fruit, eventually it will spoil. Bacteria are everywhere, and can be helpful or harmful to humans. Many of the bacteria you find in ripening and rotting veggies are not the helpful kind! 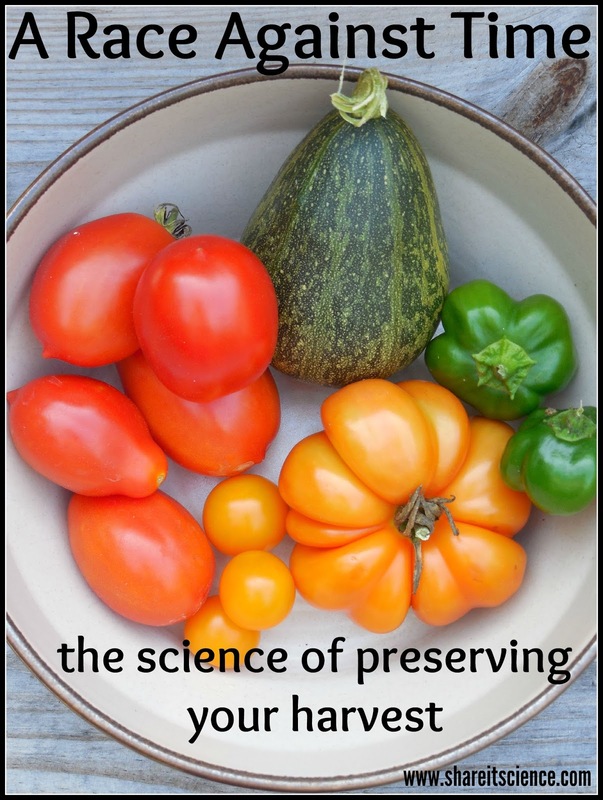 How Can You Preserve Your Harvest? Drying foods to preserve them was most likely another happy accident. The sun and wind are pretty good dehydrators. Most microbes that cause disease enjoy a moist environment to multiply in. When food is dried out it becomes an inhospitable place for those types of bacteria. You can dry produce in your oven or in an electric food dehydrator. Check out the Colorado State University Extension page for more information on drying and dehydrating your own vegetables. Electric food dehydrators can also be purchased fairly inexpensively. Freezing veggies is a quick and fairly easy option to preserve them for later use. Before you freeze vegetables you should blanch them. Blanching is a process in which you heat the vegetables for a short period of time in boiling water. They are then removed and placed in an ice bath to stop the cooking process. Blanching breaks down the enzymes that are at work ripening your food. The boiling action also helps to kill any microorganisms on the food. The blanched vegetables can then be placed in freezer bags or containers and frozen for longer periods of time. Different vegetables have different blanch times. See this link for the appropriate times for different types of produce. Although a little more labor intensive, canning is one of my favorite ways to preserve food. If you follow a recipe and work carefully then the result is safe, well preserved food that looks awfully pretty in a jar, too. I use a heat bath canner. Basically this means that after your jars are packed you boil them for a certain amount of time to destroy any harmful microorganisms and to vacuum seal your jar shut. Recipes for canning fruits and veggies will help you to determine if you need to add anything acidic to the jars to help preserve the food. Lemon juice and citric acid are common natural additives to preserving food canned at home. Microorganisms cannot tolerate acidic environments. I will be chronicling the process of canning my tomato sauce for you in a future post- stay tuned. For some great tips and recipes for canning, you should visit the Pick Your Own site. I'm excited this year to have produced enough tomatoes to make some sauce and can it for the winter. Slowly but surely, the tomatoes are ripening (I need 10 lbs of them). We're almost there, just some more patience. Then someday soon the tomatoes will be ripe and they will no longer wait. Time for that intense action I spoke of earlier. I will begin the job of blanching and peeling and cranking the food mill. I'll slowly simmer the sauce and then pack it into jars and put them in a hot water bath. It will be hours of work, but well worth the effort, the patience and time. Who Are the "Underground Astronauts"? Happy 1st Birthday "Share it! Science"! Glimpse of the Garden: Week 23, Small Potatoes!